Former federal NDP Leader Tom Mulcair will join iHeartRadio Canada’s CJAD 800 in Montreal as a political analyst beginning Tuesday, August 28, 2018. Mulcair will offer his insights on Canadian federal politics as well as Quebec provincial politics twice daily at 7:35 a.m. ET on the Andrew Carter Morning Show and at 5:05 p.m. ET on the Arron Rand Show. Later this fall, Mulcair will also make regular appearances on CTV Power Play with veteran political journalist and host Don Martin, as well as twice weekly appearances on CTV News Channel alongside anchor Beverly Thomson. “I am thrilled to be joining the top-flight news team at CJAD 800. 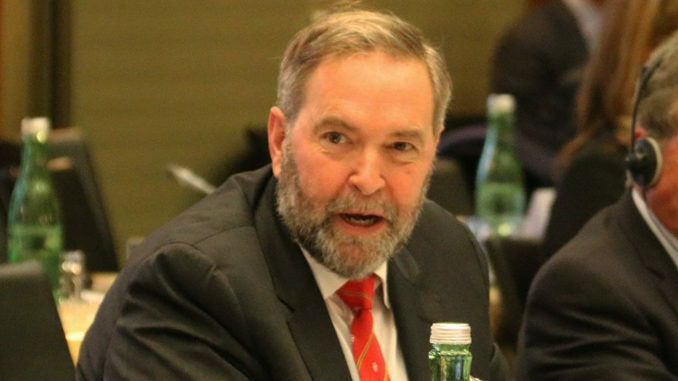 With a provincial election on the horizon, we’ll have a lot to talk about starting this summer,” said Mulcair. Mulcair will join CTV News Channel and CTV Power Play as a regular guest following the Labour Day weekend. “We’re looking forward to welcoming Mr. Mulcair and his invaluable insight to the team at CTV News Channel,” said Lis Travers, general manager, CTV News Channel. Mulcair is a former Quebec provincial cabinet minister and the former leader of the federal New Democratic Party, where he served as Leader of the Official Opposition in the House of Commons. No doubt he will be fair and balanced is the rest of the MSM. No left-wing bias here. I would occasionally flip to Power Play when the CBC’s P&P bias got to heavy but there goes that option now…..